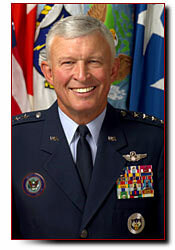 General Ralph Eberhart, who was in charge of NORAD (air defense) on 9/11, was made the first commander of the "Northern Command," the domestic unified military command established in October 2002. If the domestic use of the U.S. military escalates into full-scale martial law, the Northern Command would essentially manage it. If 9/11 had been an "intelligence failure," it is likely that General Eberhart would have been court-martialed instead of promoted. 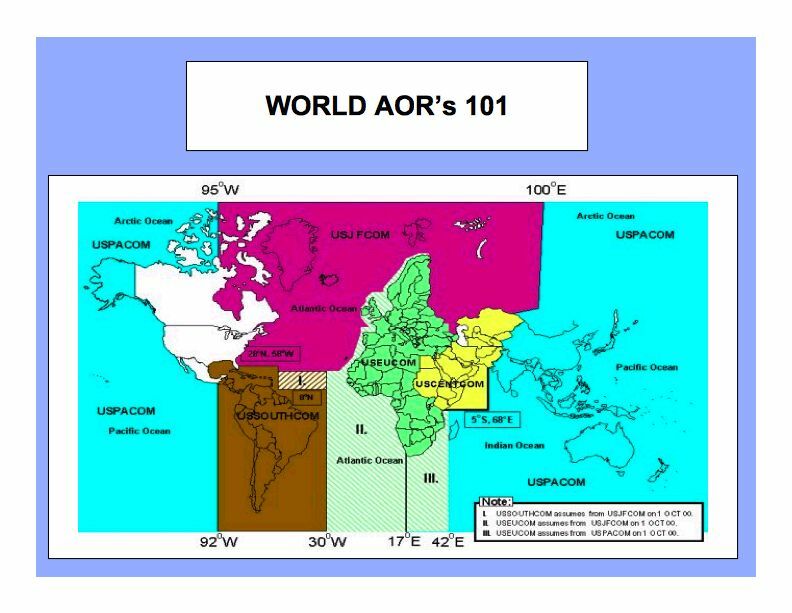 The creation of NORTHCOM in April 2002, constitutes a blatant violation of both Canadian and Mexican territorial sovereignty. Defense Secretary Donald Rumsfeld announced unilaterally that US Northern Command would have jurisdiction over the entire North American region. Canada and Mexico were presented with a fait accompli. 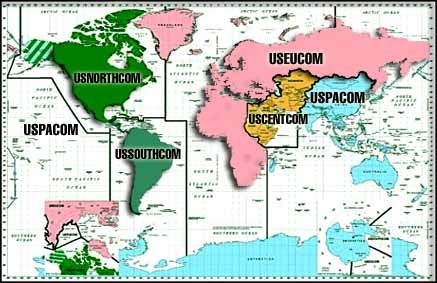 US Northern Command's jurisdiction as outlined by the US DoD includes, in addition to the continental US, all of Canada, Mexico, as well as portions of the Caribbean, contiguous waters in the Atlantic and Pacific oceans up to 500 miles off the Mexican, US and Canadian coastlines as well as the Canadian Arctic. The Northern Command was established in 2002 to fill in the gap. 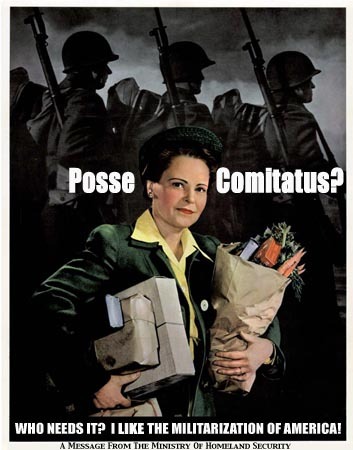 The phrase posse comitatus refers to the sheriff’s common law power to call upon the male population of a county for assistance in enforcing the laws. Enacted by Congress in 1878, the Posse Comitatus Act forbids law enforcement officials to employ the U.S. military for that purpose. 16The act consists of a single sentence: Whoever, except in cases and under circumstances expressly authorized by the Constitution or Act of Congress, willfully uses any part of the Army as a posse comitatus or otherwise to execute the laws shall be fined under this title or imprisoned not more than two years, or both. ... even though the act has clearly been violated any number of times since its passage, the Department of Justice has never prosecuted anyone for violating the act. Is the Annexation of Canada part of Bush's Military Agenda? "[Nearly 70% of the military budget] is to provide men and weapons to fight in foreign countries in support of our allies and friends and for offensive operations in Third World countries .. Another big chunk of the defense budget is the 20% allocated for our offensive nuclear force of bombers, missles, and submarines whose job it is to carry nuclear weapons to the Soviet Union... Actual defense of the United States costs about 10% of the military budget and is the least expensive function performed by the Pentagon... "
Published: Oct 2, 2003WASHINGTON (AP) - The U.S. military practices at least twice each week for the nightmare scenario of having to shoot down a civilian airliner hijacked by terrorists, the commander of forces in North America said Thursday. Gen. Ralph E. Eberhart, head of U.S. Northern Command, said a strong set of safeguards are in place to prevent an accidental or unwarranted shootdown of a commercial airplane. Commanders, pilots and air defense crews are drilled on those procedures as many as four times each week, Eberhart said. The rules allow for an order to shoot down a civilian plane only if there is no other option to prevent a Sept. 11-style attack on the ground, the general said. There are authentication procedures for such orders to make sure "someone can't just get on the radio and say, 'This is the president, I order you to shoot down that plane,'" Eberhart said. Military jets were in the air during the 2001 attacks but were too far away to shoot down the planes before they struck the World Trade Center and Pentagon. Airline passengers can be confident that their planes will not be accidentally shot down, Eberhart said. "I would take issue with anyone who would say the men and women in our armed forces are trigger happy," Eberhart said at a breakfast meeting with reporters. "I'm more worried that they would be trigger hesitant than trigger happy. We have long discussions with people to see if they're ready to do this." Eberhart said he has never heard of a case where a pilot or missile battery operator was hesitant to shoot down a hijacked airliner. Those involved have repeated psychological screening and testing on the procedures to make sure they will follow those rules, Eberhart said. The Pentagon created Northern Command in the wake of the 2001 terrorist attacks to coordinate military defense of the United States and response to attacks or natural disasters. Eberhart, a four-star general from the Air Force, said the al-Qaida terrorist network responsible for the attacks two years ago has been seriously damaged. "Most of the varsity players are gone. In most cases we're dealing with the junior varsity team or the freshman team," Eberhart said. "But we can't rest on our laurels. We've got to keep the throttle up ... If anything, I think we've bought ourselves some time." The arrests of three workers at the Guantanamo Bay prison camp for terrorist suspects have illustrated a concern about terrorists trying to penetrate the U.S. military, Eberhart said. The general said he had no indications of any coordinated terrorist effort to recruit American troops but said he had no doubt such efforts were happening. eastern U.S. bases, defense officials said. reflect a national security threat, the officials said. crisis centers and electric power industry executives. operations center during the initial phase of the power outage. resume more intense coverage if necessary. "NORAD has no reason to believe there's an imminent airborne threat,"
measure." The planes took off from Andrews Air Force Base. emergency assistance. But by last night, no such requests had come. started receiving information from them in real time," he said. electrical overload rather than an act of sabotage. and aircraft. But "no states have asked for any federal assistance,"
localities are dealing with it." As it knits together a new command for the defense of North America, the Pentagon is having to unravel a tangle of special interests, ranging from Canada and Congress to the Coast Guard and the Governors. No wonder it's taking so long. For 50 years, the Pentagon has divided the world among a handful of four-star officers: the regional commanders in chief, whose influence in their areas of the globe has grown so great that The Washington Post, in a series of articles a year before Sept. 11, likened them to the proconsuls of the Roman Empire. But throughout those 50 years, no "CINC"--as they are always called in the Pentagon--has had authority over Canada, Mexico, or the continental United States itself. That is about to change. On September 11, the United States itself became the battleground. 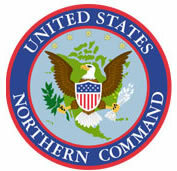 So, although recent leaks show that the details are still being worked out, the Defense Department has resolved to establish a new "Northern Command." History is littered with defeated forces that never quite cleared up who was in charge. On December 7, 1941, Japanese raiders caught U.S. forces off guard in large part because the separate commanders for the Army and Navy in Hawaii failed to coordinate their activities. After the war, the Pentagon established "unified commands" precisely to end such confusion. Under that system, one officer controls all forces in a given geographic region, such as the Pacific, or in a given functional area, such as long-range transportation. But 60 years after Pearl Harbor, the defense of the continental United States is divided among no fewer than five different four-star officers and six organizations. Most prominent of the organizations is the Joint Forces Command. For two years, it has operated the military's standing Joint Task Force for Civil Support--beefed up since 9/11--that assists civilian authorities in the event of a terrorist attack. Its Norfolk, Va., headquarters is close enough to Washington to make it easy for its commander and staff to come to the Pentagon for policy meetings, yet is far enough out of the potential blast zone to ensure its safety if the worst were to occur in the capital. Location and capabilities make "JFCOM" the likely core of a future Northern Command. But other nodes of Pentagon power would also have to be pulled into the new command. The U.S. Space Command in Colorado, for instance, would have to be in the mix. Its chief is responsible for protecting stateside computer systems. That same officer defends U.S. and Canadian airspace, in his other role as commander in chief of the North American Aerospace Defense Command, or NORAD. But it's the CINC of Joint Forces Command who is responsible for defending land and sea. Except where he isn't: The commander in chief for the Pacific, who protects Hawaii and Alaska, also hunts drug smugglers off the West Coast; the Southern Command CINC in Florida does the same along the Gulf Coast and in the Caribbean; and both of those commanders share their responsibility with the U.S. Coast Guard, which is not even part of the Defense Department, and whose commandant sits in Washington, D.C.
... on the morning of September 11, when the alarms went off in the Cheyenne Mountain, Colo., command post of NORAD, the senior officer on duty was not the U.S. chief, but his executive officer, Maj. Gen. Eric Findley--a Canadian. .... since Sept. 11, the Canadians have invited the United States even deeper into their country. The centerpiece of this continental collaboration is NORAD. Deep under Cheyenne Mountain, U.S. and Canadian officers literally sit side by side in North America's most secure command post. Their screens display data from U.S. and Canadian radars, and their radios dispatch U.S. and Canadian fighter aircraft, all but interchangeably. By treaty, NORAD's commander is always a U.S. officer reporting directly to the President, and the deputy commander is always a Canadian officer reporting directly to the prime minister. But NORAD also shows the limits of collaboration. It actually originated as a form of "defense against help." In the 1950s, it became clear that U.S. forces would need to intercept any incoming Soviet bombers as far from the United States as possible--sovereign airspace be damned. Canadians decided that only a joint headquarters would guarantee them a say in the air war that might rage over their heads. For the past few years, Canadian nervousness about a proposed U.S. national missile defense, which would probably have its nerve center at the Cheyenne Mountain command post, has prompted speculation that Ottawa would pull out altogether. Fortunately, NORAD is still standing. But throughout its history, noted Joseph Jockel, director of Canadian studies at St. Lawrence University, the binational command has had "emergency procedures for the United States to act alone and for Canada to stand down." In the event of a disagreement, all of those Canadians in Cheyenne Mountain can be replaced with U.S. personnel. American armed forces are assuming major new domestic policing and surveillance roles. "There are abundant reasons for rejecting the further expansion of the military's domestic role," says Mackubin T. Owens, a professor of strategy and force planning at the Naval War College. Looking at the issue historically, Owens wrote in an August 2002 essay in the National Review's online edition that "the use of soldiers as a posse [places] them in the uncomfortable position of taking orders from local authorities who had an interest in the disputes that provoked the unrest in the first place." Moreover, Owens said, becoming more involved in domestic policing can be "subtle and subversive … like a lymphoma or termite infestation." Though we are far from having "tanks rumbling through the streets," he said, the potential long-term effect of an increasing military role in police and law enforcement activities is "a military contemptuous of American society and unresponsive to civilian authorities." William M. Arkin is a military affairs analyst who writes regularly for The Los Angeles Times Opinion. It's really scary listening to Bush's invasion general and war criminal, Tommy Franks, predict the future. According to Franks, the Constitution is doomed and a military dictatorship is all but inevitable in the United States. In the December  issue of Cigar Aficionado (! ), Franks says if terrorists use WMD in America, "the Western world, the free world, loses what it cherishes most, and that is freedom and liberty we've seen for a couple of hundred years in this grand experiment that we call democracy." According to Franks, the people themselves would demand the Constitution be revoked after such an event. "It means the potential of a weapon of mass destruction and a terrorist, massive, casualty-producing event somewhere in the Western world -- it may be in the United States of America -- that causes our population to question our own Constitution and to begin to militarize our country in order to avoid a repeat of another mass, casualty-producing event. Which in fact, then begins to unravel the fabric of our Constitution. Two steps, very, very important." The way the rightwing nut jobs over at NewsMax phrased it, trashing the Constitution and the Bill of Rights is not so much a matter of IF, but WHEN. "Franks didn't speculate about how soon such an event might take place," NewsMax wrote. "Already, critics of the U.S. Patriot Act, rushed through Congress in the wake of the Sept. 11 attacks, have argued that the law aims to curtail civil liberties and sets a dangerous precedent... But Franks' scenario goes much further. He is the first high-ranking official to openly speculate that the Constitution could be scrapped in favor of a military form of government." Well, maybe not the first, since Dubya himself has used the "D" word on several occasions. "You don't get everything you want," Bush told Governing Magazine back in 1998 when he was gov of Texas. "A dictatorship would be a lot easier." "If this were a dictatorship, it would be a heck of a lot easier, just so long as I'm the dictator," Bush told CNN in December, 2000. "A dictatorship would be a heck of a lot easier, there's no question about it, " the appointed one told Business Week on July 30, 2001. I know, he was just kidding... or was he? "Franks’ scenario goes much further. He is the first high-ranking official to openly speculate that the Constitution could be scrapped in favor of a military form of government." In the wake of the Iraq war, 18 Iraqis and 2 Jordanians introduced a class action law suit in a Brussels Court against General Franks, Commander of the US Armed Forces in Iraq. "for ordering war crimes and for not preventing others from committing them or for providing protection to the perpetrators." The law suit does not solely implicate General Franks, who was obeying orders from higher up: Under the war agenda, high ranking officials of the Bush administration, members of the military, the US Congress and the Judiciary have been granted the authority not only to commit criminal acts, but also to designate those opposed to these criminal acts as "enemies of the State." In other words, the "Criminalization of the State", is when war criminals legitimately occupy positions of authority, which enable them to decide "who are the criminals", when in fact they are criminals. Franks' statement no doubt reflects a consensus within the Military as to how events ought to unfold. It is clear in his mind that the "war on terrorism" provides a justification for repealing the Rule of Law, ultimately with a view to preserving civil liberties. Franks' interview suggests that an Al Qaeda sponsored terrorist attack will be used as a "trigger mechanism" for a military coup d'état in America. Franks is alluding to a so-called "Pearl Harbor type event" which would be used as a justification for declaring a State of emergency, leading to the establishment of a military government. In many regards, the militarisation of civilian State institutions is already functional under the facade of a bogus democracy. This statement from an individual who was actively involved in military and intelligence planning at the highest levels, suggests that the "militarisation of our country" is an ongoing operational assumption. It is part of the broader "Washington consensus". It identifies the Bush administration's "roadmap" of war and Homeland Defense. Needless to say, it is also an integral part of the neoliberal agenda. What is terrifying in General Franks' statement is that it accurately reflects official US foreign policy. It comes from a man who obeys orders emanating from the military command structure. In other words, his statement accurately reveals the Pentagon's frame of mind. Moreover, it comes from a military man who speaks with a profound sense of conviction, who firmly believes in the righteousness of war as a means to safeguarding democratic values. In other words, the military actors and politicians are totally blinded by the "war on terrorism" dogma. Truth is falsehood and falsehood is truth. Realities are turned upside down. Acts of war are heralded as "humanitarian interventions" geared towards upholding democracy. Military occupation and the killing of civilians are presented as "peace-keeping operations." The repeal of democracy is portrayed by General Franks as a means to providing "domestic security" and upholding civil liberties. "The 'war on terrorism' is the cover for the war on dissent." Kindly help to circulate the following article to as many interested people as possible. Gen. Tommy Franks says that if the United States is hit with a weapon of mass destruction that inflicts large casualties, the Constitution will likely be discarded in favor of a military form of government. Franks, who successfully led the U.S. military operation to liberate Iraq, expressed his worries in an extensive interview he gave to the men’s lifestyle magazine Cigar Aficionado. “I, for one, begin with intent. ... There is no question that Saddam Hussein had intent to do harm to the Western alliance and to the United States of America. That intent is confirmed in a great many of his speeches, his commentary, the words that have come out of the Iraqi regime over the last dozen or so years. So we have intent. Franks ended his interview with a less-than-optimistic note. © Copyright NewsMax 2003 For fair use only/ pour usage équitable seulement. Three commentaries published recently in the US media, all by well-connected observers of the US military, have suggested that a major new terrorist attack within the United States could disrupt the 2004 elections and even result in military intervention on the streets of America as well as the suspension of the Constitution. 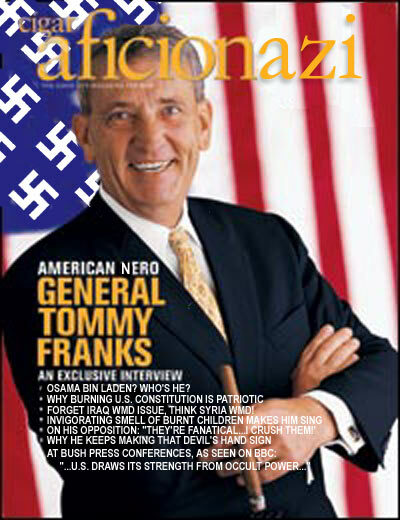 On Friday, November 21, the right-wing web news service Newsmax.com published an account of the interview given by General Tommy Franks to the lifestyle magazine Cigar Aficionado. Franks said that a terrorist attack employing a weapon of mass destruction and causing mass casualties, either in the United States or against an ally, would likely result in replacing the American Constitution with a military government. It means the potential of a weapon of mass destruction and a terrorist, massive, casualty-producing event somewhere in the Western world - it may be in the United States of America - that causes our population to question our own Constitution and to begin to militarize our country in order to avoid a repeat of another mass, casualty-producing event. Which in fact, then begins to unravel the fabric of our Constitution. Two steps, very, very important. Franks remains a fervent supporter of the Bush administration, describing Bush as a very thoughtful man, and declaring, Probably well think of him in years to come as an American hero. But according to Franks, it may be under the administration of this hero that the Western world, the free world, loses what it cherishes most, and that is freedom and liberty weve seen for a couple of hundred years in this grand experiment that we call democracy. The retired general placed the responsibility for this possible turn to dictatorship on our population, and was silent on what role the military leadership or the Bush administration would play in its establishment. The American media has apparently failed to ask him anything about it since. The same theme was touched on in the Outlook section of the Washington Post, the main daily newspaper in the US capital, in a column published Sunday, November 23, under the headlineTerrorist Logic: Disrupt the 2004 Election. The author was David J. Rothkopf, a former Clinton administration official now at the Carnegie Endowment for International Peace, a major Washington think tank. Rothkopf outlines the possibility of a terrorist campaign of suicide bombings during next falls election campaign that leads to a full-scale military mobilization. History suggests that striking during major elections is an effective tool for terrorist groups, he writes. As a representative of the Democratic wing of the ruling elite, Rothkopf is clearly concerned that such an event would profit the Bush administration. He cites examples such as the Israeli elections in 1996, when suicide bombings contributed to the victory of right-wing Likud candidate Binyamin Netanyahu, and the 2000 Russian elections, won by Vladimir Putin after a series of bombings in Moscow and other cities attributed to Chechen terrorists but widely believed to have been carried out or at least permitted by Putin's KGB. Rothkopf notes the politically symbiotic relationship between the terrorists and the hard-liners: Hard-liners strike back more broadly, making it easier for terrorists as they attempt to justify their causes and their methods. He could have added that the terrorists are a godsend for the hard-liners, providing a pretext for dictatorial methods. Recently, I co-chaired a meeting hosted by CNBC of more than 200 senior business and government executives, many of whom are specialists in security and terrorism related issues. Almost three-quarters of them said it was likely the United States would see a major terrorist strike before the end of 2004. A similar number predicted that the assault would be greater than those of 9/11 and might well involve weapons of mass destruction. It was the sense of the group that such an attack was likely to generate additional support for President Bush. This is a remarkable assertion. Rothkopf describes this elite audience as serious people, not prone to hysteria or panicmilitary officers, policymakers, scientists, researchers and others who have studied such issues for a long time. The vast majority of them, he says, believe that a terrorist attack worse than September 11that is, killing thousands or even tens of thousands of Americanswill take place in the course of the 2004 election campaign, and that this attack will benefit the political fortunes of George W. Bush. The role of the military in domestic policing was the subject of a column published November 23, written by William Arkin, a well-connected military analyst for the Los Angeles Times. It was Arkin who last year revealed the Bush administrations decision to revise US military strategy to target seven countries - Iraq, Iran, North Korea, Libya, Syria, China and Russia - for possible nuclear attack. The column was headlined, Mission Creep Hits Home, American armed forces are assuming major new domestic policing and surveillance roles. It examines the role of the Pentagons Northern Command, the newly established center for controlling all US armed forces within the continental US, Canada and Alaska, and includes an interview with its commander, Air Force General Ralph E. Eberhart. According to Arkin, the Northern Command has defined three categories of operations, with increasing levels of activity: temporary, emergency and extraordinary. He writes: It is only in the case of extraordinary domestic operations that the unique capabilities of the Defense Department are deployed. These include not just such things as air patrols to shoot down hijacked planes or the defusing of bombs and other explosives, but also bringing in intelligence collectors, special operators and even full combat troops. * A decision by Defense Secretary Donald Rumsfeld to expand the mission of the Counterintelligence Field Activity (CIFA), established last year to protect critical infrastructure, authorizing it to maintain a domestic law enforcement database that includes information related to potential terrorist threats directed against the Department of Defense. * The assigning of military special agents to 56 FBI Joint Terrorism Task Force operations at FBI field offices, investigating potential threats to the military in local communities inside the United States. * The decision by Eberhart to transform Joint Task Force Six, a drug-enforcement unit of 160 soldiers at Ft. Bliss, Texas, into a counterterrorism force called Interagency Task Force North. Congress originally authorized joint Task Force Six in 1996, in the first exception to the Posse Comitatus Law, which bars the US military from assuming domestic police functions. * The National Geospatial-Intelligence Agency, another little-known body, is gathering an urban data inventory combining unclassified and classified data on 133 cities, as well as US border crossings and seaports, to create a national spatial data infrastructure. This information, which Arkin describes as down to the house level, could be used either for surveillance or military targeting. According to Arkin, the CIFA has been given a domestic data mining mission as well: figuring out a way to process massive sets of public records, intercepted communications, credit card accounts, etc., to find actionable intelligence. This amounts to reviving in another form the Total Information Awareness program, headed by Admiral John Poindexter of Iran-Contra fame, which was supposedly shut down earlier this year by Congress after a public outcry. Arkin concludes: Outside the view of most of the public, the government is daily expanding military operations into areas of local government and law enforcement that historically have been off-limits. And it doesnt seem far-fetched to imagine that those charged with assembling actionable intelligence will slowly start combining databases of known terrorists with seemingly innocuous lists of contributors to charities or causes, that membership lists for activist organizations will be folded in, that names and personal data of anti-globalization protesters will be run through the data mine. After all, the mission of Northern Command and other Pentagon agencies is to identify groups and individuals who could potentially pose threats to Defense Department and civilian installations. Here, then, is a glimpse of the real state of affairs in the United States on the eve of the 2004 election year. Ruling circles widely anticipate a massive terrorist strike that would boost the flagging political standing of the Bush administration or even lead to a suspension of the elections and the establishment of military rule. The US military is actively preparing for this possibility by readying troops for use in domestic policing and by assembling a database of likely political opponents. The obvious question is: given the expected consequences, is it not in the political interests of the Bush administration or sections of the military/intelligence apparatus to engineer such a terrorist attack? Or at least to insure that it takes place, by looking the other way, on the model of September 11?